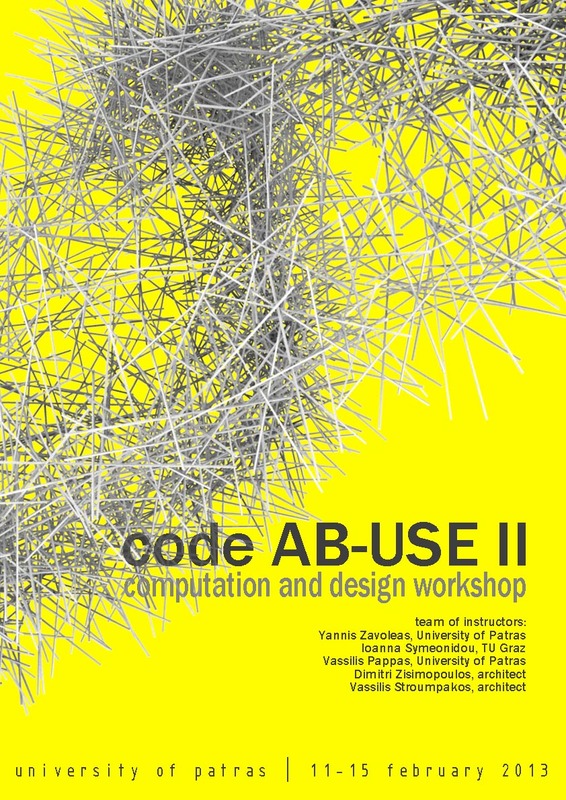 The objective of this workshop is to further explore the possibilities opened up by the incorporation of computation, especially of scripting in the conception of architectural space. The workshop uses the scripting platform of MEL (Maya Embedded Language), being integrated in Autodesk Maya design software. Key concepts and techniques of parametric design are being developed, as these are also compared to more conventional ones of digital representation. Among the findings is the observation that architectural education has already embraced the digital medium in the form of a multifaceted challenge, mainly in studio research. The related experiments acknowledge the wide spectrum of approaches taking place somewhere in the borders of architectural education, also in relation to other disciplines. In respect, the presented work may be an addition to the ongoing discourse, further identifying this new field. Project title: NESTED LIVING ROOMS. Credits: Yannis Zavoleas (principal, concept). Collaboration: I.Chinoporou, S.Dambassi, A.Papadopoulou, A.Sideri. Kenneth Frampton, Ware Professor οf Architecture, Graduate School of Architecture, Planning and Preservation, Columbia University, Νew York, ΝΥ. Specificity refers to the manipulation of the house unit, whereas flexibility refers to the order of the general scheme, conveyed by a system. Specificity and flexibility respond to two very different scales, the human and the block. Pursuing the ideal house often results in a weak management of the whole, while giving priority to the block may end up putting aside issues pertaining to the small scale. The design proposes a space of intermediate scale, an adaptor bridging the qualities of the general scheme to those of the house unit. This space adaptor brings together the neighborhood of four houses, functioning as a shared living room (marked as yellow). Another version of the space adaptor referring to a group of 4 to 6 neighborhoods forms a wider living room (orange). The total of 15 of these groups diffuses into the main yard (red), being the common living room of the total block. Rethinking the Human in Technology-Driven Architecture, Center of Mediterranean Architecture, Chania Crete, Greece, 2011. Zavoleas, Yannis. “House-as-Machine: the Influences of Technology during early Modernism,” in Rethinking the Human in Technology-Driven Architecture. Spiridonidis, K., Voyatzaki, M., eds. Thessaloniki: EAAE/ENHSA, 2012, pp.381-93.